When considering what investment securities (Stocks, ETFs, Mutual Funds, etc.) 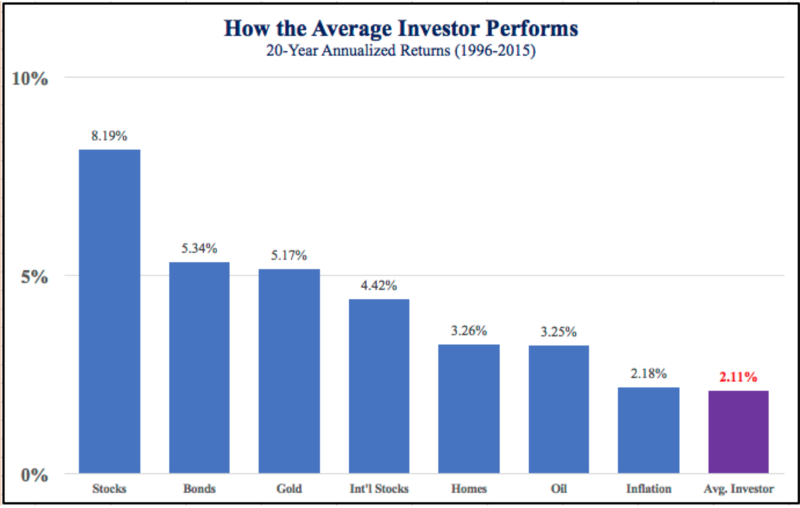 in which to invest, Investors often look to past performance, typically understanding Past Performance guarantees absolutely nothing about Future Performance. What is perhaps less understood is the numbers quoted are Investment returns – this is the rate of return of the fund as a whole. Of course, individual investors all enter and exit at different times, thus each individual experiences a different rate of return, which start as a gross (the accounting meaning of gross), pre-tax number. The situation is further complicated by the Investor’s Individual tax bracket – tax rates on investments range from 0%-37%. The net of all the tax considerations result in the Investor Return. This is the focus of this article. As you can see, the average Individual Investor has underperformed every listed asset class - an exceptionally bad outcome. Why does this continue to happen? The explanations are simple: One, Investors are not investing in the historically best-performing asset class over time, stocks. And two, individual investors have been buying high and selling low – the exact opposite of the path to investing success. There are no other explanations for this outcome. Why does these phenomena exist and persist? The answers here are a necessarily vague, though I will proffer a few thoughts. On any given day, during any given month, or over the course of any year or set of years, stocks, whether in the form of direct ownership or via a collective product (mutual fund or ETF), will exhibit large variations in price - or in other words, volatility. Over the very long term, however, the trend of stock prices is "up and to the right". Just as the prices of other products in our lives change daily - gas, milk, homes - without altering our perception of the products' utility, investors should not use volatility as a litmus test for risk when considering investment in equities. Doing so causes you to sell low. The television is the absolute worst place to learn when to hit the Buy or Sell button…magazines are a close second. For the average amateur investor, buying should be done on a periodic basis (monthly or quarterly) over long spans of many years. The market dips will have you buying more shares and market tops will limit your share purchases. On average, you will accumulate shares at an average price and be able to “Ride the Wave” of American Capitalism – about 242 years and counting. If you know where you are trying to go, it makes it much easier to get there. As part of a thorough Financial Plan, an individual should have an Investment Solution providing an arc towards an ending market value to support him/her/them when entering retirement – this is the accumulation period. Somewhere in the Investment Strategy should be an amount of periodic investment required to reach the end state of the accumulation period…this is generally a monthly savings requirement. Given that markets are unpredictable, chaotic, and at times gut wrenching, having a strategy brings some order to the madness. So long as you dutifully continue the contributions through thick and thin and have a reasonable long-term investment return expectation, you stand a very good chance at reaching your desired ending value. For most of us, bobbing and weaving in and out of the market based on mysterious signals (or tips) leads to the prized 2.11% return displayed above. Financial Planning costs deter some individuals from seeking professional financial advice. Clearly, fees matter. Consider the following though: if as part of the value delivered by a Financial Planner, a Client’s Average Investment Return moves from the 2.11% half-way towards the equity returns, the financial planning client will realize significantly higher ending account values...I leave it for you to calculate the difference of 2.11% returns versus 5.11% returns over 30 years. In their September 2016 paper, Vanguard identified "Behavioral Coaching" as adding 1.5% to Client returns annually....there are other contributors that add to the value delivered to financial planning clients. So if you find yourself experiencing returns at or near the 2.11% rate described above, you may be a good candidate to start interviewing financial professionals to serve you in achieving your financial goals.